University of Nottingham > Blogs > Sustainable Nottingham > WasteNott > A Hi Vis Hello! 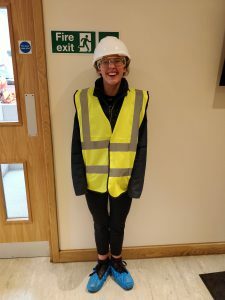 My strong PPE look at the #wasteNott enva site tour last week! Ever wondered who is behind the UoN Sustainability social media posts? As of October, it’s normally me! My name is Meg and I’ve recently joined the university’s sustainability team as a communication and engagement assistant. I’m a third year Natural Sciences student, on the Maths and Physics pathway. My hobbies include yoga, eating and spending too much time learning about sustainable living on my phone. I hope that by the end of this blog you’re have a better idea about who I am, my plans for the year and how to share your ideas with me! Get a reusable cup! Despite what Instagram tells you, it doesn’t need to be beautiful to qualify. Choose loose fruit and veg, I find I often cannot finish a whole plastic bag portion so I’m also reducing my food waste! Initiatives like the Plastic free pantry or Nottingham Zero Waste Collective are a great way to bulk buy without the plastic packaging (https://pelacase.com/blogs/news/100-easy-ways-to-be-more-eco-friendly). Keep on listening, sustainability is not just about coffee cups and plastic (http://blogs.nottingham.ac.uk/sustainablenottingham/2016/06/06/11852/). Look out for: more blog posts; more interviews of inspiring people within our university community; our Fairtrade Fortnight campaign in semester two, and events shared on the UoN Sustainability Facebook page. Help me: I’d love to learn about your sustainable initiatives and concerns. You can contact me, to share your ideas and events you’re already running, by messaging the UoN Sustainability Facebook page or emailing me at pmymjgr@nottingham.ac.uk.